When it comes to hardwood floors, people want them in their homes for the simple maintenance, durability, and beauty. The versatility allows them to be incorporated into nearly any room and with almost every interior design style. With hardwood floors, however, is important the care and maintenance you provide is diligent. With that in mind, we at Leading Carpet Cleaning would like to share some basic maintenance and damage prevention tips to keep your floors looking amazing and lasting well beyond their projected life expectancy. Hardwood floors require daily surface cleaning, and spot cleaning to maintain their shine and condition. 1) Hardwood floors can be impacted by dirt, dust, and other debris. As it accumulates in conjunction with traffic, the surface will wear down, as the finish diminishes and the top layer scratches. Ensuring the debris is removed daily from the surface is crucial to the care of the wood floor. A dust mop, a vacuum designed for hard surfaces or the option for the bare floor setting, or soft-bristle broom can all effectively remove the filth off the floor. Whichever implement is best for you, ensure to thoroughly clean the floor, including the edges and corners. 2) With a clean water damp microfiber cloth, wipe away any spots or sticky residues and promptly follow up with a dry microfiber cloth to remove the lingering moisture. 3) Only use cleaners and aids that are specifically designed for to the type of wood floor and finish in your home if you ever need to revitalize the floor or clean more serious buildup. 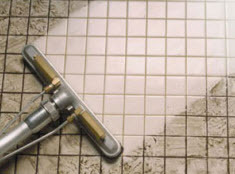 Avoiding any agents or implements that can cause damage to the floors is just as important as the cleaning. Moisture and abrasive cleaners, cleaning aids, and other implements should stay away from the wood flooring. 1) Forbidden on your wood floors is moisture of any kind. Substances that have moisture need to stay clear from the color and if they make contact, instant action is required. Dry microfiber cloths need to be used to wipe up any accidents. Even short term exposure to moisture can cause residual effects. 2) Consider UV film treatments, custom blinds, curtains and drapes on your windows, especially on the windows that permit the sun’s rays from penetrating inside. Direct sunlight can cause your wood floor’s finish to fade and the planks to dry out. 3) To contain the filth and moisture, protect your hardwood floors with area rugs, runners, and walk-off mats around the entry points and areas where there is a lot of foot traffic. Vacuum the rugs daily and the back of them weekly. 4) Don’t wear spiked shoes on the floor to avoid potential damage; for example high heel shoes and cleats. 5) Pets track in dirt and debris and their claws can scratch the wood surface. Protect your wood floors and pets happier with regular shampooing and get their nails trimmed. 6) Your home’s humidity levels should optimally be between 35% and 55% to avoid the wood floor from shrinkage effects. Whether you are looking for hardwood floor installation or professional refinishing, the experts of Leading Carpet Cleaning can assist. Call us today to schedule your next cleaning service! If you own your own business you probably have more important things to worry about than the appearance of your carpets, yet you should worry because the appearance and condition of your carpets is one of the first things your patrons see when they come into your place of business. According to the knowledgeable experts at Leading Carpet Cleaning, if the first impression your customers receive is less than stellar it could mean the difference between them doing business with you or going elsewhere. Many business owners are reluctant to schedule a professional commercial carpet cleaning service but it may be for the wrong reasons. When it comes to looking after your commercial carpets, the majority of business owners assume that vacuuming and the occasional DIY steam cleaning and shampooing is all that is needed to keep them in top-notch condition. What you may not realize is that it takes a lot more than vacuuming and shampooing with a rented carpet cleaning machine to keep your carpets clean and sanitized. In the long run you may even be doing more harm than good going the DIY route, ruining your carpets in the process. To help protect your investment and keep your carpets looking just like new, the experts at Leading Carpet Cleaning have debunked three of the most common commercial carpet cleaning myths. •	My carpet is less than 12 months old – it doesn’t need to be cleaned yet: If you don’t think that your carpet needs to be cleaned until it begins to look dirty you are in the majority. Unfortunately, by the time your carpet begins to show the signs of abuse from dirt and debris the damage has already been done. Microscopic particles of dirt become trapped in your carpet and the constant foot traffic can grind the tiny particles deep into the carpet fibers causing them to tear and break down. Over a period of time the constant walking back and forth will cause permanent damage resulting in premature replacement of your commercial carpeting. •	Why hire a commercial carpet cleaning service when I can rent a machine and clean them myself? – With grocery and home improvement stores on just about every corner, renting your own carpet cleaning machine is relatively quick and easy but you need to be award that it can cause permanent damage to your carpets. In fact one of the first things that you will notice about these machines is the amount of water that the machine expels into your carpets is far more than it can effectively remove. Not only does it take a long time for your carpet to dry, it also turns your carpet into a petri dish that is more than capable of growing mold and mildew along with damaging your carpet backing and padding. •	I can keep my carpets smelling fresh and clean with a store brought deodorizer – household deodorizer products can spell disaster for your commercial carpet. Power deodorizers that are designed to be used with your vacuum cleaner contain talcum powder which regular vacuuming doesn’t always remove. In the majority of cases, the talcum powder will build up, become deeply embedded in your carpet fibers. The next time that you try to clean your carpets yourself, the deodorizer will leave behind a chalky white stain on the surface of your carpets that will require a professional carpet cleaning service to remove. To learn more about professional carpet cleaning services for your commercial business or residential home, contact the knowledgeable experts at Leading Carpet Cleaning today. Have you ever removed a piece of furniture or rug that has been sitting on top of your carpet only to discover your carpets have turned yellow underneath the furniture? When carpets, especially lighter colored carpets, turn yellow this is a phenomenon called Phenolic Yellowing. If you’re seeking an answer as to the cause of phenolic yellowing, and if it can be corrected, Leading Carpet Cleaning will explain more about phenolic yellowing and how it affects your carpets. You may have first noticed a yellowish stain on your carpet after you have removed a piece of furniture or even a large area rug. This is called phenolic yellowing. It can occur on any color carpet but is most visible on lighter colors such as grays, or beige colored carpet. Phenolic Yellowing is due to what the professionals call “gassing.” There is an agent called Butylhydroxyltoluene (BHT) that is used in carpets to help preserve them, especially those made from latex such as tufted carpets. BHT is also used as the underlayment for all carpets. When a rug is put on top of the carpet and the BHT is on the bottom, the rest of the carpet can’t breathe. As the BHT rises up, it is trapped by the rug or furniture and it will begin to discolor the carpet’s fibers. However phenolic yellowing can still occur even if carpet doesn’t contain BHT. 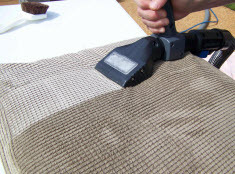 Carpet uses a latex glue to hold the pile of the carpet to the backing of the carpet. The backing of the carpet, combined with the latex glue, can create the similar affect. Some backing for carpets contain the BHT as well, so small traces of BHT is still in most carpet. Again, the same affect of the yellowing merges as the carpet doesn’t breathe properly. Additionally, the backing of rugs can also cause the Phenolic Yellowing to increase, which is why it isn’t recommended to have rugs or furniture that doesn’t allow carpets to breathe properly onto of them. As already stated, the best way to prevent Phenolic Yellowing from occurring is to allow carpets to breathe. Use furniture that provides circulation underneath it. Another thing that is also beneficial when it comes to preventing Phenolic Yellowing is to vacuum and have your carpet cleaned regularly. This will prevent the BHT from becoming trapped. Unfortunately there is no way to correct the discoloring. Once Phenolic Yellowing occurs, the damage is already done. This is why it is so important to know how to clean and care for your carpet. You may need to replace your carpets or deal with the discoloration. Prevention is the key when it comes to Phenolic Yellowing. 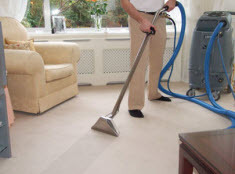 Leading Carpet Cleaning provides a wide range of services from carpet cleaning, upholstery cleaning, mattress cleaning and rug cleaning to hardwood floor and tile cleaning services and more. If it is time to have your carpet or other surfaces of your home deep and professionally cleaned, be sure to contact Leading Carpet Cleaning today. Without proper care and maintenance, nothing will last and carpets are not the exception. After investing in carpets, depending on the quality of the manufacturing and the routine care and maintenance the carpet receives, dictates the projected lifespan. Lack of professional services and owner’s neglectful ways, will result in the carpets untimely need for replacement. Leading Carpet Cleaning would like to list the most common outcomes of what happens when the carpets are neglected. Drop in the Rooms Overall Appearance: People take in the whole picture when entering a room from top to bottom. No matter how pristine and clean the room is, poorly kept and maintained carpets will instantly make the room look like a disheveled mess. Colors and Texture is Altered: People generally pick carpets because the color and/or patterns fit with the established décor and the softness is especially comfortable. When carpets are vacuumed little or not at all the layers of debris comprises the feel and colors. The carpets look dull and dingy and the fibers are coarse and matted. Additional damage continues to develop as the carpets are more neglected. Carpet Lifespan is Decreased: As previously mentions, carpets can lose their longevity if care and maintenance are not up to par. Carpets should be vacuumed daily, stains immediately treated and professional services retained 1-2 times a year. Trapped Debris & Residues: There is a plethora of debris that accumulates on the carpets. A few examples of the substances include dirt, food residues and crumbs, dead skin cells, shed hair, and pet dander. As the particles, contaminates, allergens, and residues build up, the more they will be trapped within the fibers as the layers continue to grow. In a short amount of time the carpets will look dingy and dull and start to distort. Pungent Carpets: Attached to the stains and debris are odors. When the carpets are not properly treated and vacuumed, and they go years without professional cleaning, the odors continue to get stronger. In some cases, homeowners may not even realize the pungency about them but guests are instantly assaulted by the stench. Spreading of Germs, Bacteria & Viruses: Germs, bacteria, and viruses have a number of ways they are spread; through direct contact, airborne, and so on. The odds of these contagions settling on the surface of your carpets are pretty high. According to research, there is potentially up 200,000 of bacterium per square inch can be found in dirty carpets, and E.Coli or Salmonella is common. Carpet Mold & Microbe Growth: Organisms such as mold spores and mildew for example, are highly likely on the carpets. Without removing them with vacuuming and disinfecting the carpets with a professional cleaning, these spores can take seed and spread in little time under the right conditions. Warmth and moisture can let mold consume materials including the carpets, carpet padding, subfloor, and it can even spread to baseboards and the wall if left untreated. Looking like a biohazard zone, the smell, and expedited deterioration along with health risks are all derived from mold. Insect Infesting Carpets: Triggering allergies and asthma attacks as well as contributing to other health risks, insects can infest your carpets without you realizing it. Fleas, ticks, ants, and dust mites are just a few of the common examples of insect infestations that can occur in the carpets. They can eat, reproduce, and die for generations if the carpets re left neglected for too long. To avoid these atrocities, be sure to vacuum daily, treat spills before they become stains, and call Leading Carpet Cleaning today to schedule your carpet cleaning service.